Are your management company responsibilities taking up too much of your time? The chances are you may not even have wanted to become a director of your apartment property management company in the first place. None of the other residents wanted to take it on, but you care about the apartment block where you live and like to see things done properly… So now you find yourself burdened with a whole lot of legal, financial and safety liabilities – all of which gobble up huge amounts of your time. And then there are all the deadlines… Getting the management company year-end accounts to Companies House on time. Issuing the confirmation statement to Companies House on time. Issuing accounts to your fellow leaseholders. Renewing insurances … the list goes on. We take on all the difficult, time-consuming, paper-generating block management tasks that come with being a residential management company director anywhere in England and Wales. You’re in charge, but we do the work for you. We make sure all those deadlines are met, so you’re not sitting looking at a box of receipts when the management company year-end accounts are due to be filed with Companies House in two weeks’ time. Or calling round for quotes when the insurance policy’s up for renewal. The pressure’s off you. You have peace of mind knowing that everything is in order – and that you yourself are protected from legal action. And you get back your free time. to get back your free time? Email info@verticalvillage.co.uk and we’ll be in touch. Or fill in the form below and we’ll send you the set of free cards we’ve devised to help you schedule everything you need to do throughout the year as a residential management company director. It’s help for you as the director of your residential management company. We work with management company directors everyday and we know which tasks cause you the most stress. We’re based in Surbiton in Surrey, but offer our service to support directors of management companies all over England and Wales. ensuring that you are fully compliant with the terms of your lease. Meanwhile, you retain the day-to-day tasks, such as managing maintenance work, which are easier (and thus more cost-effective) for you to do yourself. Want to delegate the stressful administrative tasks? Email info@verticalvillage.co.uk and we’ll be in touch. Or fill in the form below and we’ll send you the free set of cards we’ve devised to help you schedule everything you need to do throughout the year as a residential management company director. What price peace of mind and freedom from the burden of your your legal, financial and safety obligations? We charge an annual fee of £150 per flat. Interesting point… when asked which they would prefer: to take on the responsibilities of the residential management company director themselves or to pay £150 per year, most flat owners are happy to reduce the burden on the director and pay the £150. Don’t wait till the Companies House deadline or insurance renewal date is looming! Contact us now we’ll get all your management company responsibilities sorted for you in good time. Fill in the form below and we’ll send you our special free box of cards. These will help you schedule everything you need to do throughout the year as a residential management company director. Would you like us to contact you to talk about how we can help you with your statutory responsibilities? No. We’ll post you a box of cards which will help you schedule your tasks as management company director – regardless of whether or not you choose to appoint us to help with your administrative tasks. We’ll also email you to arrange a time for a no-obligation conversation about how we can make your life easier as a residential management company director. Concerned about your privacy and inbox overload? 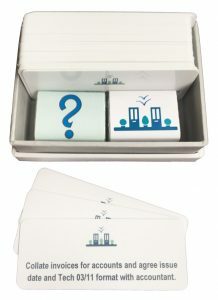 PS There’s a small surprise gift inside the box – besides the cards that will help you schedule everything you need to do throughout the year as a residential management company director.